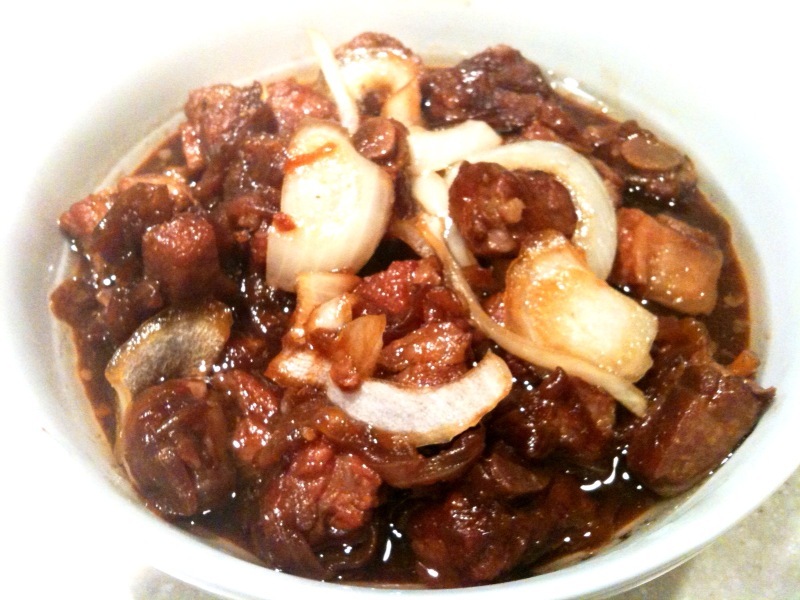 So out of all the stew/braised meat dishes, this one is hubby’s favorite. It’s actually an old Chinese recipe that’s passed on through the generations, and my Mom makes it often also. I’ve put a little twist on it last night and the result turned out so well, so below is what I did. Use a sharp knife to cut between the spareribs. Put most of the onion slices in the bottom of a large saucepan (save about 1/4 for later). Place the spareribs on top of the onions. Add the wine, vinegar, sugar, soy sauce, and water (I doubled the ingredients 1-5 to make sure all the meat’s covered). Cover and bring to a boil over high heat then reduce heat to low. Cook about 1.5 hours, add the remaining onions, simmer for another 20-30 minutes, then serve hot.